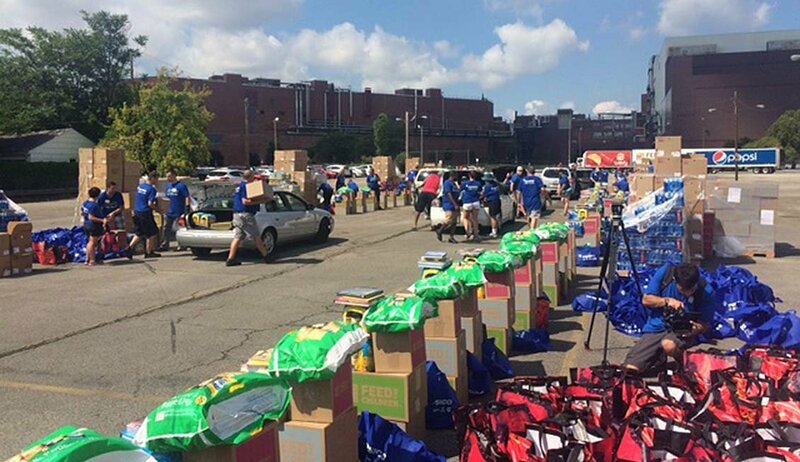 It was a special day in Rochester, NY as PepsiCo, Tops Friendly Markets, Feed the Children and the Catholic Family Center teamed up at Eastman Business Park to give away over 28,000 pounds of food and essentials to 800 local families in need. There were roughly 100 volunteers at the event providing preselected recipients with nonperishable food items, personal care items, Frito-Lay snacks, Quaker granola bars, Aquafina, and other items provided by Tops Friendly Markets. “About 33% of Rochester lives below the poverty line so we’re glad to give back and help families get through the summer and prepare for the school year,” said Mike Farmer, a sales zone director for PepsiCo’s Frito-Lay division. This is the second annual event they have held in Rochester and they will be hosting the event in a variety of other major cities throughout the country.